KISS bassist Gene Simmons guest stars on this week’s episode of the CBS series CSI: Crime Scene Investigation, and a preview of the show is available. In the episode, entitled “Long Road Home”, the CSIs investigate the murder of a rock and roll groupie and the disappearance of a prostitute that both have ties to a mysterious band. CSI: Crime Scene Investigation airs Wednesday at 10 PM ET on CBS. 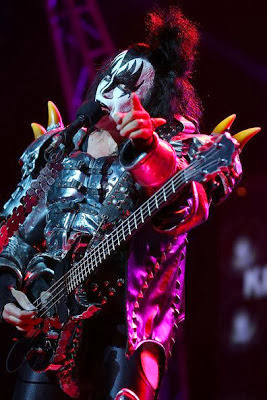 On April 10, Simmons and the original lineup of KISS will be inducted into the 2014 Rock & Roll Hall Of Fame at a ceremony in New York, along with Nirvana, Peter Gabriel, Hall and Oates, Cat Stevens and Linda Ronstadt.